Microsoft Outlook PST file are prone to corruption. There are several error messages displayed in Outlook while opening a corrupt Personal folder (PST) file. So we tried to describe all possible Errors.For each PST Error we have described its symptoms and also explained its precise reason.Because sometimes Inbox Repair Tool (Scanpst.exe) i.e. internal tool in Outlook provided by Microsoft to fix problem in corrupt PST file is unable to resolve the issue. The file Outlook.pst is not a personal folder file. The file Outlook.pst could not be found. Error 0x80040116 – Outlook.pst cannot be accessed. Data error Outlook.pst could not be accessed. Cyclic redundancy check. The file Outlook.pst could not not be accessed. Unable to display the folder. Can’t move the items. Could not complete the operation. One or more parameter values are not valid. Errors are detected within the file computer Outlook.pst. Quit all mail-enabled applications and Outlook, so run Scanpst.exe to diagnose and repair errors within the file. For additional info regarding the Inbox repair tool. The file Outlook.pst cannot be opened. Cannot expand the folder. The set of folders cannot be opened. Can’t move the items. The items could not be moved. It was either already moved or deleted, or access was denied. The Inbox Repair Tool does not recognize the file Outlook.pst. Scanpst.exe hangs endlessly and does not perform the repair. The PST file fixed by Scanpst.exe is empty and doesn’t contains required information. “Fatal Error 80040818” whereas repairing the PST file. Loss of data while trying to repair Corrupt PST files. Scan interrupted due to an error. No changes have been made to the scanned file. unexpected error prevented file access. Reason: If the header is broken or corrupted, and can’t be recognized by Microsoft Outlook, then Outlook can suppose the entire file isn’t a legitimate PST file and report this error. Corruption of Outlook PST file. Outlook PST file is located on a network server that is unavailable. Reason: This error occurs if the index of the PST file is damaged. 4. Data error Outlook.pst could not be accessed. Cyclic redundancy check. Reason: This issue occur if the PST file is corrupted. 5. The file Outlook.pst could not not be accessed. Unable to display the folder. Reason: When the PST file is corrupted and Outlook cannot read the hierarchy information from the file, it will display this error. 6. Can’t move the items. Could not complete the operation. One or more parameter values are not valid. 7. 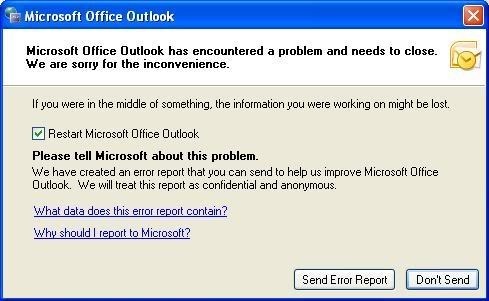 Microsoft Outlook has encountered a problem and needs to close. We are sorry for the inconvenience. Reason: Microsoft Outlook encounters an sudden error or exception, it’ll report this error and quit. There are numerous reasons that may raise this error, as well as the Outlook PST file corruption, bugs in Outlook program, insufficient system resources, defective messages, etc. 8. Errors are detected within the file computer Outlook.pst. Quit all mail-enabled applications and Outlook, so run Scanpst.exe to diagnose and repair errors within the file. For additional info regarding the Inbox repair tool. Reason: The PST file consists of 2 components, the file header, and also the following data part. The file header contains the most vital information regarding the entire file, like the file signature, file size, compatibility, etc. When Microsoft Outlook is attempting to open a file, it’ll initial scan the header half and verify its data, as an example, the file signature as well as the compatibility info. If the verification fails, it’ll report the “The file Outlook.pst isn’t a private folders file.” error. Otherwise, it’ll continue reading the remaining data part and if there are any errors in this part, it’ll report the higher than mentioned error, and recommend you to use the Inbox repair tool(Scanpst.exe) to repair it. 9. The file Outlook.pst cannot be opened. Cannot expand the folder. The set of folders cannot be opened. The hard disk where your Outlook PST file is located on has some bad sectors. 10. Can’t move the items. The items could not be moved. It was either already moved or deleted, or access was denied. Some properties of the items may be corrupted or invalid, which makes the copy or move operation fails. How to prevent PST file corruption? Do not over limit your PST file because it slow downs many operations in a PST file. Fetch knowledge about your PST file size limit and approach to left some space left. Shutting- down Outlook abnormally usually cause PST file to corrupt. So try to prevent it from abnormal Shut-down. So always exit Outlook before Shutting down your Computer. Microsoft Outlook lock downs while operating a large emails in one time. So try to not operate them in a batch. Network Environment cannot support dense access of the PST file and causes frequent corruption of PST file corruption. So try to store it on local computers not on remote drive or server. Some Anti Virus programs damages the PST file. Microsoft OneCare may even delete PST files and Anti virus is also needed for protecting our PST file because it contains a lot of emails and useful data. So always be careful to choose one. Some Add-Ins may cause PST file to corrupt. If PST gets corrupted frequently disable the Add-ins. Try to Backup your PST file on weekly basis. If your PST files are corrupted, then try to repair and fix it by using Inbox Repair Tool i.e. a free tool Installed to fix Outlook PST file corruption and If it fails to do so we have a recommended Third party software that is SysTools Outlook Recovery used to resolve and fix any kind of mentioned error in a PST file.